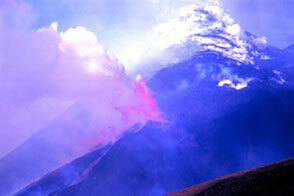 Italian volcano travel stories from Mount Etna,Stromboli and Vulcano. Find out what its like to be on a volcano when it erupts. 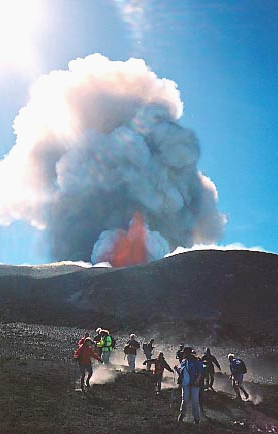 On June 1st 2000 I was part of trekking group who were to hike across the summit area of Etna. 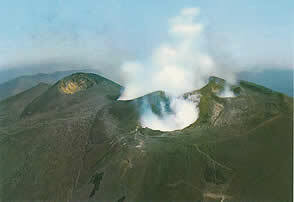 The route we were to take is shown ,on the summit image, as a white path from left to right which passes in front of the smoking crater in the foreground. We made it to the slope on the left before retreating. Previous to this we had observed some small but impressive lava fountains erupting from the southeast crater from a vantage point on the rim of the Valle de Bove. Reluctantly we tore ourselves away after spending an extra 10 minutes here- a vital 10 minutes as it turned out. 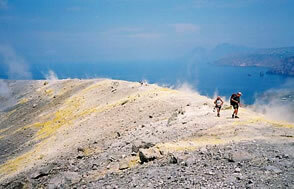 The picture below was taken by Paul, a fellow trekker, of this activity at the SE crater- we were quite a way away! Having finally left the SE crater we headed for the summit area in a big Mercedes overland truck , driving along an ash blackened road with banks of ash layered snow on either side. We got out at about 10000 feet.We began walking to the summit area , the altitude meant that it was a bit puffy and I found myself at the back plodding up a long ash blackened slope with rocky lava and snow patches. As a I neared a crest I looked up to see a pure white puff of cloud coming from the ridge in front of me and then within a second a vertical jet of red hot lava getting taller shooting straight up into the air. The people ahead of me started to come back towards me - I'd only just got there!! I grabbed my camera and took a few pictures as they ran towards me . The guides were telling us to run and keep running back the way we had come - on rough ground this was a bit tricky but all aches and pains go when you are running for your life and the threat of being barbecued!! 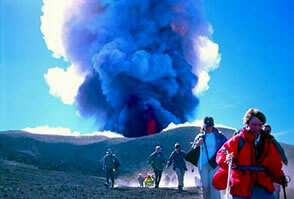 We ran for a long time and a long way .The Guides Mobile phones ringing to check we could see the eruption!! and to check we were ok. The cloud behind us filled the sky and was getting taller and taller and the lava jetting 100s of meters into the air . I could see lava bombs flying through the air up to 800-900m above the crater and some bombs apparently landed up to 2km away. The eruption cloud below shot up over a mile into the sky and was the biggest eruption of that year so far.Tephra showers fell to the SE of the volcano as the wind was blowing this way. We eventually ran to the truck which had been sent up to rescue us. We originally thought it was the Bocca Nova crater which had erupted but it turned out to be the SE crater we had seen earlier. The vent had clogged during the time we were driving and walking up the mountain this blockage was then blasted out of the volcano at 10.15 . Right on CUE!! The 10 minutes extra watching the SE crater erupting earlier on meant we were further away than we would have been if we had been on time - 10 minutes would have taken us into a real fix virtually next to the crater! On the 31st May at 10.45pm the wind was blowing the opposite way. 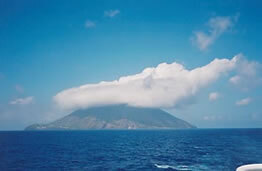 I arrived in Vulcano on a small boat from the neighbouring island of Lipari. Before we landed we could smell the sulphur wafting across the sea. On landing we headed up through a small village to the start of the track and a big warning sign telling of all the dangers ahead. So we carried on! Vulcano is only small so a quick hike and we came to the crater rim.Sulphur fumeroles filled the air with steam as we looked down into a inverted cone shaped crater. Clambering around we found bright yellow sulphur around steaming fumaroles at about 400C- stand too long and it will melt your boots! Go too near the fumeroles and you'll get a lung full of breath stopping warm, moist hydrogen sulphide.We had to cover our faces with scarves in the steamy bits. After a circuit of the crater we set off down a sloe deep in ash -like walking down a giant sand dune . The sea in vulcano bubbles with warm water so after a mud bath we had a swim. Three tips from me here take all your jewellery off, wear an old swim suit and lastly if you re a girl just check you re not going more au natural than you intended! 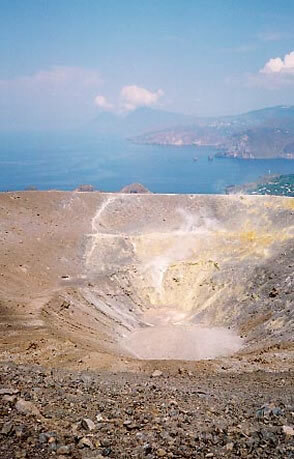 Stromboli is a 3000ft climb from sea level to the summit. Climbs start in the late afternoon and descend in the early hours to view the lava display at night. We set off at about 4.00pm through thick undergrowth up and and up. The main thing I found out on the way up was that capers are not shellfish but flower buds!!! Finally to the base of the final ridge where we would wait until dusk then ascend to the summit to see natures fireworks on cue. The ridge was obscured by cloud and soon it became pitch dark we couldn't go back it was too dangerous so we headed up into the murk by headtorch. I closely followed the guides feet - any more than a metre and i would lose his feet. 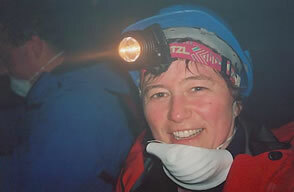 I pointed my headtorch either side of the narrow ridge- nothing but black and swirling mist and the occasional growl of the volcano. This photo is the best summit shot I got! Near the top we found a mother and her two chldren frightened and alone in the dark. Our guide took them under his wing and they came down with us. With our bamboo poles and headtorches we plunged down through deep ash in the pitch dark slipping and sliding as we went. A long walk down on mile after mile of ash and dust- skiing and slipping only by head torch.Through the bamboo and out for a beer at 2am! You see a lot of young people in Stromboli with plastercasts on their arms. There are no cars so people scooter up and down the narrow streets and crash into walls- hence plastercasts.